I had my candy sushi program this week and it was fun! There was a lot of prep the weekend before and the morning of like going to the store to buy the candy. Side note: it took me about 15 minutes of wandering the store looking for fruit roll-ups for the “seaweed” to go around the sushi rolls. I finally had to ask. Babyfood aisle. Of course. Sigh. My examples for the teens. So here’s the whole process. Make a batch of rice krispie treats the regular way but instead of putting them in a 9″ x 13″ pan as you usually might do, spread them out to be about a half an inch thick onto a wax paper covered cookie sheet. (I made three batches and I’m glad that I did because I had 17 teens there! 17!) Then assemble your candy. I had Twizzlers, Swedish fish, Mike & Ikes, and fruit rollups. 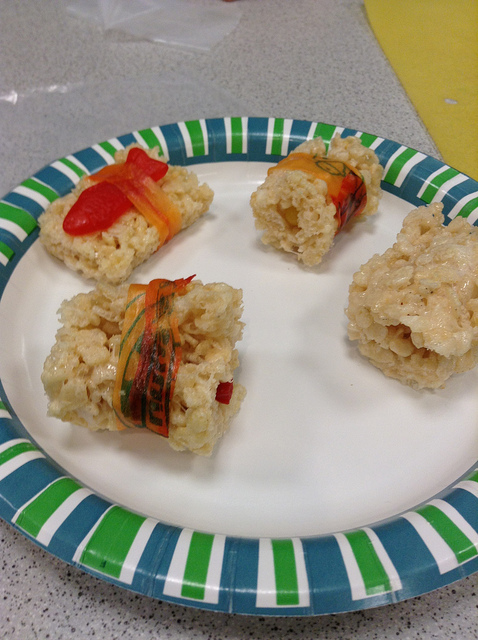 To make the rolls I cut up strips of rice krispie treat about 2″ by 6″. Then to make one kind of sushi, I put a Twizzler in the middle, rolled it up, then rolled it up again in a sheet of fruit roll-ups, and then sliced it into little sushi rounds! Cute! I also did similar things with Mike & Ikes in the middle. 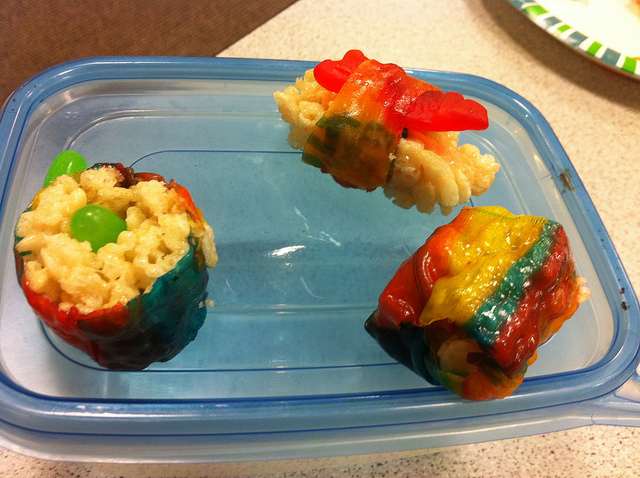 Then I made little rectangles of rice krispie, put a Swedish fish on top, and wrapped fruit roll-up “seaweed” like a belt around it. Those were the cutest. But how could I have done it better? To have more options, less time, or more structure in the program. If I had more supplies the teens could have been even more creative and taken the sushi to a higher level of crazy – which I like. Or make the program less time because I had a hard time filling the time I did have. Finally, it I had a more structured program, for example with a challenge or contest or something like that, it would give another goal for the teens. That’s one thing I need to constantly remind myself of. These teens like and need structure. Most of them are middle schoolers so they aren’t necessarily to the point in high school where you realize you can be a bit more rebellious or free and do what you want. They kind of like to be told what to do, at least that has been my experience so far. It was still a good program, I just keep thinking about how it could be better! Also, I was just talking about books I read growing up that I probably wouldn’t recommend to a teen now because of their content: hello, Kushiel’s Dart trilogy! I distinctly remembering reading one of the books in Advanced Biology senior year of high school and getting all stammery and weird when a classmate asked me what it was about. “Ummmmm, it’s fantasy?” I squeaked. That’s what you get when you read sci-fi/fantasy/erotica in high school. Or the books that I wasn’t allowed to read as a child because Mom thought they would scare me, like The Witch of Blackberry Pond. I tried telling her it won the Newbery, but I had to return it to my school library heartbroken. Anyway, this was all to say there’s another great article about age appropriate books over at XOJane. s.e. smith writes the best articles about YA. Check it out. Finally, I had a post up at the Hub this week where I get huffy and tell people to go read YA, all while using the word “apologia.” It’s really a win-win. Go read that, too! It was yummy – in a sugar rush sort of way! Why on earth are fruit roll-ups in the baby food aisle. There is something deeply wrong about that. Cool program, though! I guess “babyfood” aisle also means “weird uber-processed snacks you give your older children” aisle! I liked your rant about YA reading. (Someday, I will get there… after a zillion more reading detours). 🙂 To my untrained eye, a lot of YA is about werewolves and vampires… and it’s all geared towards girls. I secretly like (oops) vampire stuff… as long as they aren’t depicted as blood sucking menaces. Thanks! I have so many reading detours and plans, it’s a bit overwhelming! But yes, there ARE a lot of YA books about werewolves and vampires, but dystopias are gaining ground. And a lot is geared toward girls so one thing I would like to see is more guy-oriented fiction . . . just finding those “girl” books that can appeal to boys, too. Thanks. True story… we in Boxford asked an 18 year old employee of ours to help with YA high school level reading suggestions. She had a lot of trouble finding stuff suited to guys. I suggested she reach out to friends of hers who are guys . She did and that didn’t help.